Jean always maintains that she never worked, although following a 3-year Modern Language and secretarial course at the Institut Français du Royaume-Uni her first job was at the London headquarters of Air France, followed by 2½ years with a Fine Art Book dealer researching into rare art books for international libraries, universities and museums and attending major auction houses. Marriage and family put work on hold for several years until she was lured back into part-time secretarial work for an architect who worked from home at Chenies Place, and where she saw from start to finish his amazing restoration of Hall Barn, Beaconsfield and other historical country houses. Thanks to his persuasive powers she also typed letters for Rev. Canon Tom South, ex-Rector of Amersham in his retirement job with the Redundant Churches Commission, also a fascinating interlude helping Sir Roderick Barclay (ex-Ambassador and banker) write his memoirs and occasionally getting co-opted into assistance with the dogs and resident pony! I won’t mention mad Mr. Tussaud of waxwork fame, also a local resident, for whom she did some typing when he wasn’t chasing his wife round the garden with an axe – he was soon carted away and her services no longer needed. The demands of more children stopped work for a bit, until she became a Chiltern Hospital outworker for a consultant dermatologist & allergist, relaying patients’ diagnoses to GPs. She also spent 4 years as part-time secretary to a professor of occupational psychology who ran post-graduate courses worldwide in his Adaption-Innovation team-building theory, mainly for international companies, the US military and universities. 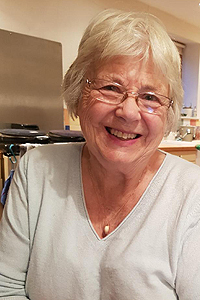 Jean has had a varied and haphazard working life, mainly jobs for family friends, and mostly part-time, so her expertise is in doubt and she has certainly not kept any formal references to show for her pains! She has enjoyed being secretary to the Chesham Chamber of Trade & Commerce (now Chiltern Chamber) since 1996.